Spotted at Seattle's Sonic Boom Records. Sonic Boom is great. I just bought the 33 1/3 Tusk volume there the other day! It's good to see them reusing all their Alien Ant Farm plastic insets. Sweet. 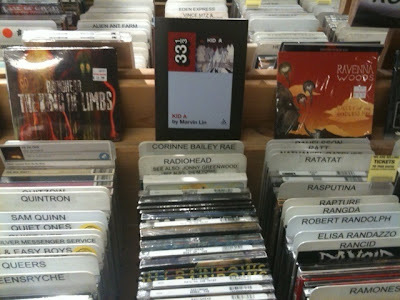 It never occurred to me how well a 33 1/3 book would fit on the shelf behind a stack of CDs. More record stores should do this.